The aircraft features inertial / sattelite navigation systems, radio navigation system, digital maps, optical fiber and digital communication multiplex comm systems. The comm system has two UHF/VHF radios, Link-16 capacity, and encryption capability. FBW has quadruple redundancy, and the engines support full authority digital engine control, FADEC. 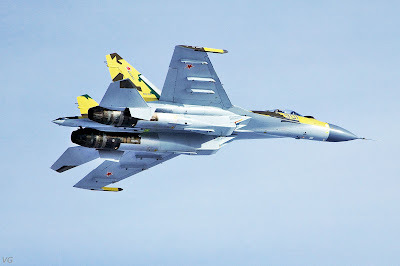 Su-35BM, as an true multirole fighter, will have both air-to-air, air-to-ground, and anti-ship weaponry. Whole current pallete of A2G precision missiles and bombs will be supported on Su-35BM. Regarding air-to-air, the aircraft has an Archer, Alamo, and Adder family capability (R-73, R-27, R-77). Su-35BM will also be able to launch ultra-long range active radar missiles. The type of this weapon shown on the Su-35BM model was Novator KS-172S-1 AAM. The same missile has been presented on the displayed Su-35BM at MAKS 2007 airshow. The KS-172S-1 has an engagement range over 300 kilometers, can be used against any kind of aircraft flying from 3 meters altitude to 30 kilometers altitude, up to 4000 kilometers per hour of speed, and up to 12G. The onl　y thing that’s confirmed is that Su-35BM will have ultralong range radar missile engagement capability; KS-172S-1 has not been asured. The other ULR AAM in Russian developement is Vympel K-37/R-37M. It’s an upgrade of MiG-31M’s R-37 missile, which has been sucessfully tested against targets 300 kilometers away. Other Vympel’s designs are not confirmed either; such as ramjet, thermal, or antiradiation variant of R-77. This capability could be easily added at some future point. Vympel also stated that it has finished working on the upgraded variant of antiradiation R-27P. 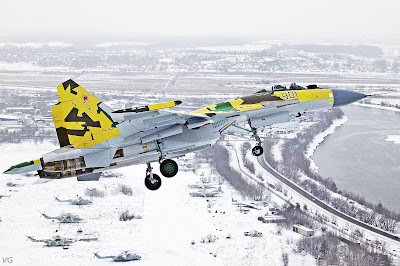 Since L175M is chosen for the standard electronic warfare module for all new Russian aircraft, R-27P could be connected to work in conjuction with Su-35BM’s EW unit. Both short and long burn variants of the antiradiation R-27, eg. the 27P and the 27EP, are on the payload list. The misterious unspecified long-range anti-ground, anti-ship and anti-radar missiles are still a matter of debate, but several sources indicate that GRAU-coded 3M14AE and 3M54AE missiles are the unspecified weapons. Both missiles are produced by NPO Novator, and Sukhoi has a long tradition of partnership with this design bureau; this raises the issue of long-range AAM too, since Sukhoi is clearly pushing the Novator’s KS-172S-1 design, while the VVS wants Vympel’s R-37M for MiG-31 deep modernization variant. In any case, Russia won’t use two similiar types of AAM’s in the same time period, so the R-72 could be used for export, while the R-37M would be used on domestic version of Su-35BM. 3M14AE and 3M54AE are the missiles from “Kalibr” system, developed from naval “Club” system. The first is LACM, while the other is standard anti-ship missile. The unspecified anti-radar missile could turn up as new Raduga X-58UShE. It works in wide-band regime, and has a maximum range of 200 km. The sole-carried large ASM/AGM is suspected to be Yakhont-M, GRAU coded 3M55A. Yakhont-M is the upgraded export variant of P-800 Ony　x missile. Original Ony　x has the range of 300 km.